Apple's been rather coy about the Apple Watch's water-proof capabilities, but that hasn't stopped some intrepid developer making the first swim tracking app for the fruity smartwatch. Developers Active in Time built the Apple Watch app to monitor stokes and stroke type, lengths and heart rate. The latter should make for a more accurate reporting of calorific burn, which the company says is lacking in today's market. "At the time of writing there are no available consumer level swim tracking devices which are also capable of monitoring heart rate in the swimming pool," Active in Time's Ted Bradley wrote on the company's blog, which outlined the story of creating the app. "Heart rate is an incredibly useful metric for calorie burn estimation, tracking fitness improvements and pacing during workouts," he continued. And he's right. While many triathlon watches come with straps that work underwater, and others that clip to the ear, there's no dedicated swim tracking with heart rate on the wrist, which is capable of displaying your live stats. 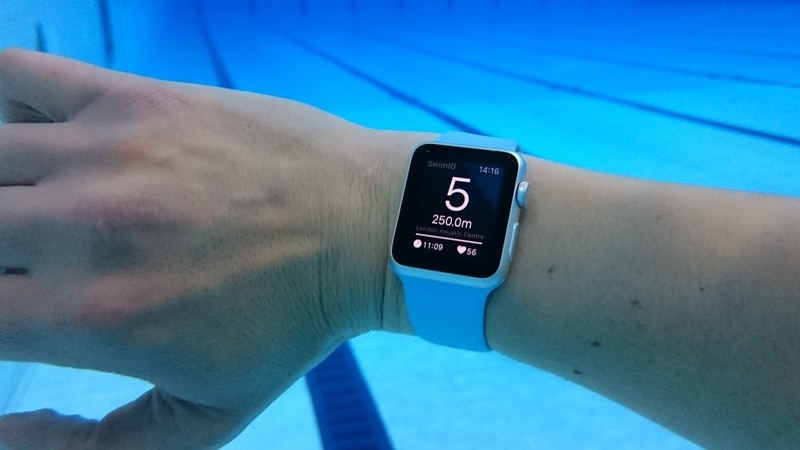 It's a huge gap in the market, and the Apple Watch seems to be an unlikely ally of the swimmer. The company had been making a similar app for Pebble, but got started on its Apple Watch app when watchOS 2 was announced at WWDC 2015. The update meant that Watch apps could be developed without a partner iPhone version. However, the biggest surprise for many won't be the Watch's unique suitability for swimming – it's that Apple's smartwatch is even waterproof at all. While the smartwatch is only rated at IPX7 – which means it can be submerged in 1m of water for up to 30 minutes – that hasn't stopped some Watch owners from taking their smartwatches into the pool. And while the touchscreen doesn't work under the waves, it seems the Digital Crown works fine. A rare win for physical controls in the age of touch. And it's these intrepid developer daredevils that gave Active in Time the confidence to take its Apple Watch into the pool. However, it doesn't mean we can all start counting strokes with our smartwatch. The problem for the band of British developers is that although their testing have been a raging success, until the Watch gets certified for swimming, the app's going to remain unreleased. Firstly, until watchOS 2 hits this Autumn it can't be used by the wider public, and even when it is released, Apple's unlikely to ratify an app that could lead to thousands of people putting their warranties at risk. For Active in Time, that means high hopes for the Apple Watch 2, and will be praying that the Cupertino company boosts its IP ratings for the second generation.